It is not easily attainable, in both cost and time aspects, to regularly monitor the height keeping performance of all aircraft operated by every operator. ICAO Asia/Pacific region has determined the Minimum Monitoring Requirements (MMR) to sample, for each operator, an adequate number of aircraft per type and series. The MMR are given in tables indicating types and series of aircraft, the number of sample aircraft from each fleet and the monitoring period. See MMR document for details. The Height Monitoring Unit (HMU) is a ground-based height monitoring system with one central and 4 outer receiving stations. The outer receiving stations are ideally installed to form a square of some 30 NM. The HMU measures geometric height of an aircraft using the Multilateration principle. Multilateration obtains three-dimensional positions calculated from the time difference of arrival (TDOA) of signals at each receiving stations from the transponder of an aircraft in flight. At least 4 receiving stations are required, and the fifth improves omni-directional coverage, accuracy and system redundancy. The HMU calculates the difference between the geometric height above Mean Sea Level (MSL) of an aircraft and the actual height of its assigned Flight Level above MSL calibrated by meteorological data at the time and the position. After calibration of Assigned Altitude Deviation (AAD), the HMU obtains the value of Altimetry System Error (ASE) of an aircraft. EUR RMA is now operating 3 HMUs, the NARRMO is operating 6 Aircraft Geometric Height Measurement Elements (AGHMEs) by a similar principle in USA and Canada, the NAT CMA is operating 1 HMU in UK. 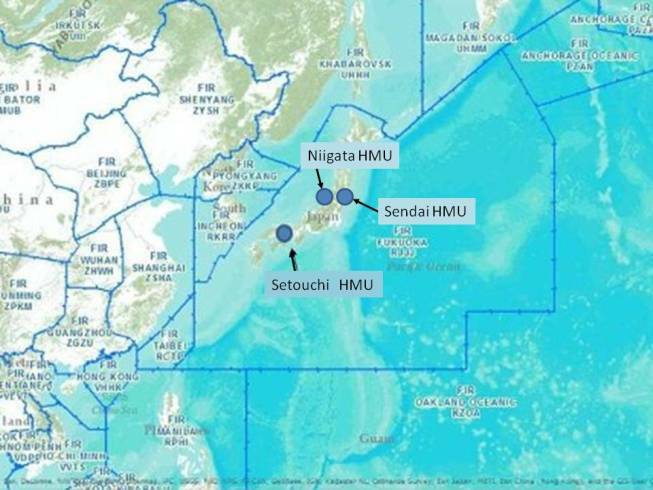 Japan has implemented the 3 HMUs, the Setouchi HMU, the Niigata HMU and the Sendai HMU, as shown in the following map. See "HMU Status & Monitoring" page for current operating status. The GPS-based Monitoring Unit (GMU) is a mobile system to record the geometric height of an aircraft in flight using Global Positioning System (GPS) signals. The GMU consists of two GPS antennas to attach to the left and right cockpit windows, a GMU unit and a laptop computer as a recording device.The GMU records continuous three dimensional position data in the level flight portions of a flight. The measured height data is processed after flight by calibration with meteorological data to determine the actual height of the assigned Flight Level at the time. The GMU needs an engineer in the cockpit to record in-flight data and a longer period of level flight than HMUs. JASMA does not have GMUs. AAMA, China RMA and MAAR are operating ADS-B height monitoring system for height keeping performance monitoring.